I’m a big fan of automated configuration management software, and an even bigger fan of utilizing Vagrant for developing configuration modules/cookbooks/states/playbooks/whatever in a fast and easily reproducible environment. I previously created Puppet Sandbox for just this purpose, but have more recently taken an interest in using Ansible for configuration and orchestration. Up-to-date Vagrant base boxes for Arch are hard to find. Arch Linux doesn’t have Python 2 installed by default, which is a dependency for Ansible. To solve the first problem, I decided to create a generic Arch Linux base box myself. In the not too distant past, the way to do that in a repeatable fashion was Veewee, but the project has gotten progressively more complicated to set up and use. Lucky for me, there’s a new kid on the block for creating machine images named Packer, built and maintained by the author of Vagrant, Mitchell Hashimoto. To make a long story short, I wrote Packer Arch, which is a bare bones Packer template and installation script that can be used to quickly generate Vagrant base boxes for Arch Linux. My goal with the box was to be as minimal as possible, and to roughly duplicate what you’d get when purchasing an Arch Linux VPS from a provider like DigitalOcean. Starting from that point, I wanted to configure everything else via Ansible. Solving the Python 2 problem was a little trickier. Ansible itself provided a possible solution with their raw module, but Vagrant’s provisioning integration with Ansible requires Python 2 to be on the base box before you can run any playbooks. It’s the classic “chicken or the egg” problem. Since utilizing Ansible for configuration as well as orchestration tasks was desirable, but would require having a proper setup outside of Vagrant anyway, I just decided to ignore Vagrant’s provisioner altogether. Instead, I wrote a short script to handle the one-time tasks so I could interact with the VM using Ansible in the exact same fashion as I would any other server. # Variables listed here are applicable to all host groups. Create my user account and grant it full sudo privileges. Add my SSH public keys to the newly created account. Download a current package mirrorlist based on my geography. The user management steps are handled by running the tasks tagged “bootstrap” from my regular master playbook, and the mirrorlist is downloaded and then transferred to the machine via the copy module. Once the script runs, I paste the environment variable export lines that it echos into my shell. This makes Ansible purposefully ignore SSH host key checking; since the VM is transient, we don’t need to permanently store its key. To give you an idea of the actual playbooks I’m using with this setup, take a look at my Monarch project, and in particular, the users.yml file under the common role. As always, let me know if you need any help putting all of the pieces together. If you’ve ever used an insecure Wi-Fi connection in a public place (think coffee shop, airport, etc. ), your personal information could be at risk. Anyone on the local network could potentially be monitoring your traffic and they could even hijack your sessions to control accounts that you’ve logged into. Every week I meet up with some friends to work on personal projects, and the venue only offers an open wireless connection with no encryption. To mitigate the risk of leaking personal information, I’ve tried a handful of strategies and eventually settled on using sshuttle. 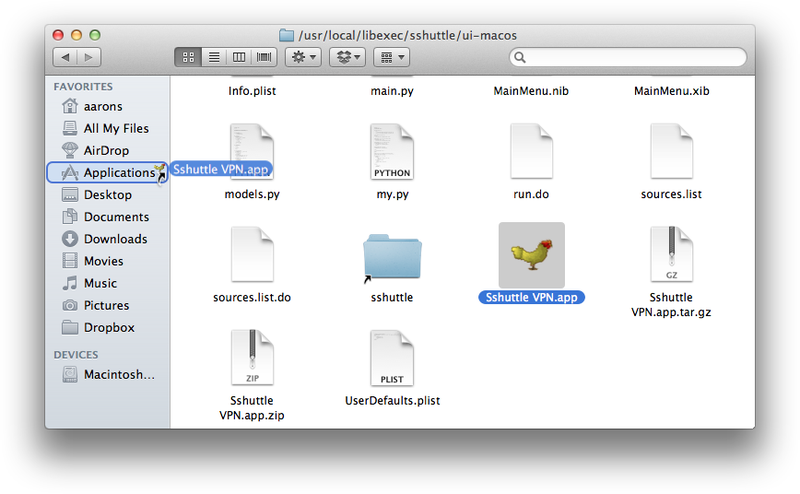 The sshuttle utility is part transparent proxy, part Virtual Private Network (VPN), and part SSH. It solves a lot of common problems with encrypting your traffic, and it does so in a very efficient way. There’s no need for a complicated pre-existing infrastructure. All you need is Python 2.x, and a remote machine you can SSH to that also has Python installed. You don’t even have to be an administrator on the remote machine. The project’s README has a lot more information on its theory, design, and alternate uses. But, you have to adjust your machine’s proxy configuration settings each time you set up the tunnel, and then tear it all down when you’re done. This method will not force absolutely all traffic over the tunnel, as things like DNS lookups and a lot of command-line tools will just ignore the proxy. You’re also encapsulating TCP-over-TCP, which can cause performance problems. I briefly messed with the Sidestep project to automate these setup/teardown steps on OS X, but ran across repeated authentication issues and wasn’t overly impressed with its developer. Overall, I needed a more elegant solution. Unfortunately, pre-compiled binaries are not made available for every release, and documentation for building sshuttle is non-existent. The project uses a build system called ‘redo’ instead of the more-customary ‘make’, so the process is a bit different than what most people are used to. NOTE: You may have to adjust paths or permissions slightly depending on your machine’s setup. For the GUI app, we need to create an alias instead a symlink, because Spotlight will not index symlinks. Yes, you could just copy Sshuttle VPN.app directly into /Applications, but then you’d have to remember to copy it every time you update/rebuild sshuttle. 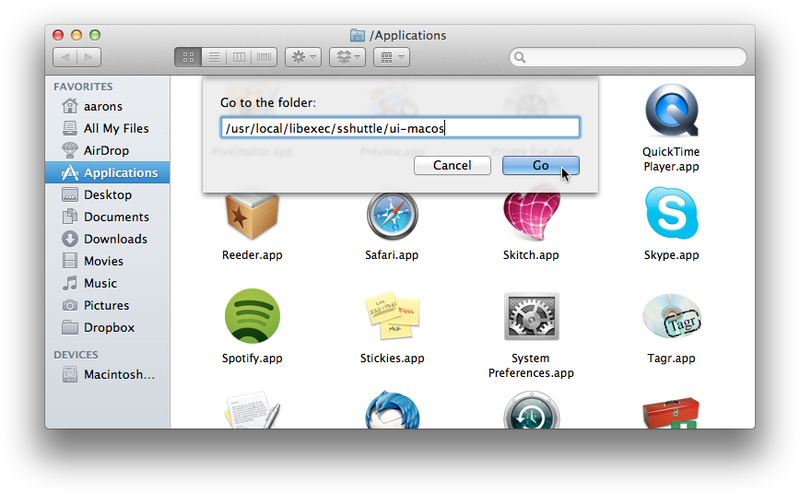 Open Finder and press Command-Shift-G to open the “Go to the folder:” dialog box. Type /usr/local/libexec/sshuttle/ui-macos in the box and click the Go button. Click and hold Sshuttle VPN.app, then while holding down both the Command and Option keys, drag the app over to Applications on the left and release the mouse button. Due to some sysctl changes in OS X Lion, you will have to reboot your machine after you run sshuttle for the first time. An adjustment to the net.inet.ip.scopedroute kernel flag needs to be made, and it can no longer be done during runtime. This is required so forwarding rules will be honored by the firewall. Finally we can get down to actually using sshuttle! It’s flexible enough to do fancier things, but for our particular use case, we just need to forward all traffic over the tunnel. Run that, and all of your traffic (including DNS requests) will be transparently proxied through an SSH connection to example.com. You can verify this by browsing to http://ifconfig.me. The Sshuttle VPN.app GUI is pretty self-explanatory, just make sure to enable the Send DNS requests through this server checkbox, and select Send all traffic through this server for the “Network routes:” option. You may see a bunch of “warning: closed channel …” messages when running sshuttle (either on STDOUT or in your system.log), but these warnings are safe to ignore. The developer knows about the issue and is thinking of the best way to suppress/eliminate the condition. Be aware though, this will flush out all rules, not just the rules set by sshuttle, so it may have unintended consequences. If you’re unsure, you can always reboot the machine to get connectivity back to normal. Admittedly, sshuttle takes a bit more work than other solutions to get up and running, but the security it provides gives me peace of mind when forced to use insecure Wi-Fi networks. If you have any issues, there is an active mailing list for the project, or you can always send me a note and I’ll see what I can do to help. Since I started working from home, I’ve found that I spend even more time sitting at my desk than I did when I worked at the office. I’ve never had great posture and started noticing that my back and shoulders were pretty achy by the end of the day. Once I got to that point, it was harder to stay focused on work and I was becoming noticably fatigued. 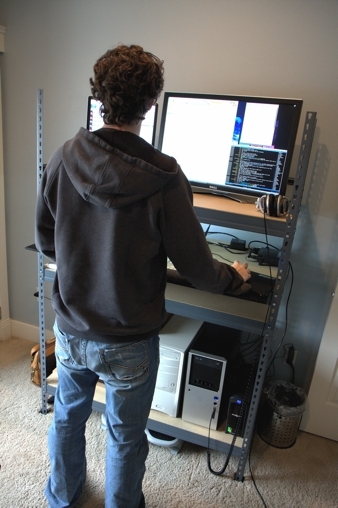 There seems to be a surge of people converting to standing desks recently, and there’s no shortage of personal stories and information on why they can be beneficial. 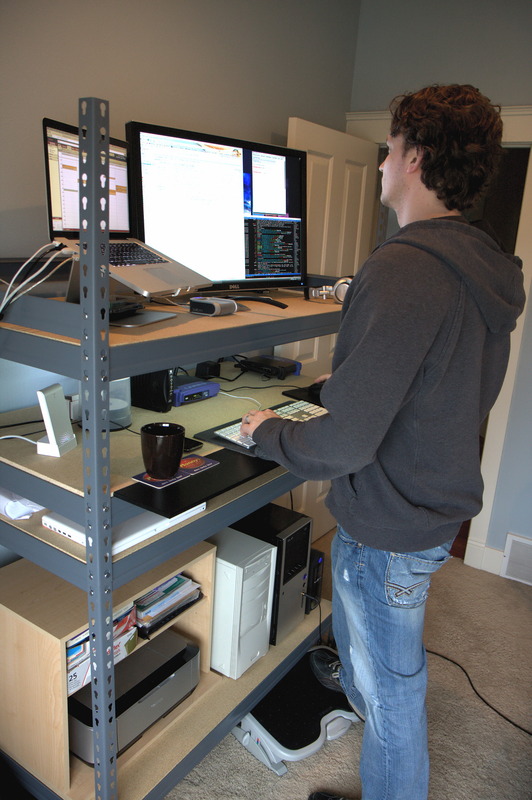 Some very nice commercially-made standing desks are available, but not knowing if I’d actually like using one, I didn’t want to make a big up-front investment. 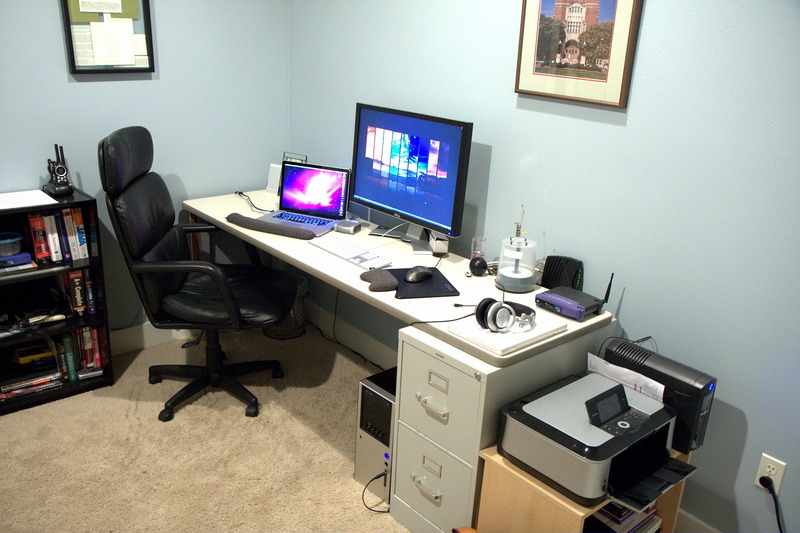 For reference, my old desk was simply a cubicle desk surface that had been reclaimed from a dumpster. I always liked the amount of horizontal space it provided, and it was extremely solid, but not completely ideal. 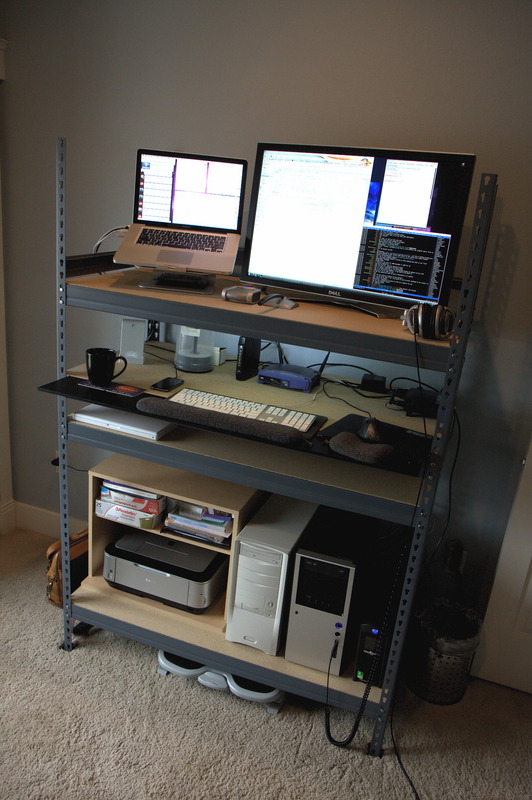 I decided to convert a cheap shelving unit into a standing desk as a way to test the waters. At 48"W x 24"D x 72"H, this $80 rack from Lowes was pretty ideal, and I figured that after a month if I didn’t like it, the shelf could always be used in my garage. 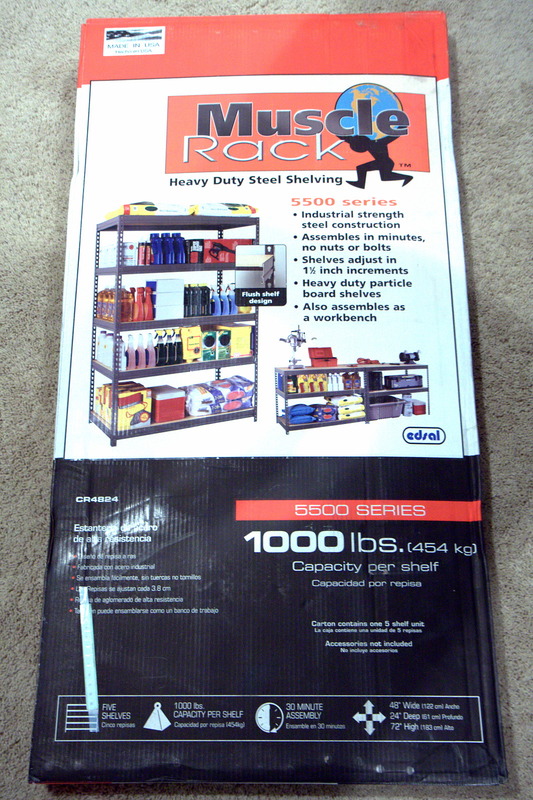 I tried to follow OSHA guidelines as closely as possible when setting up the height of each shelf. 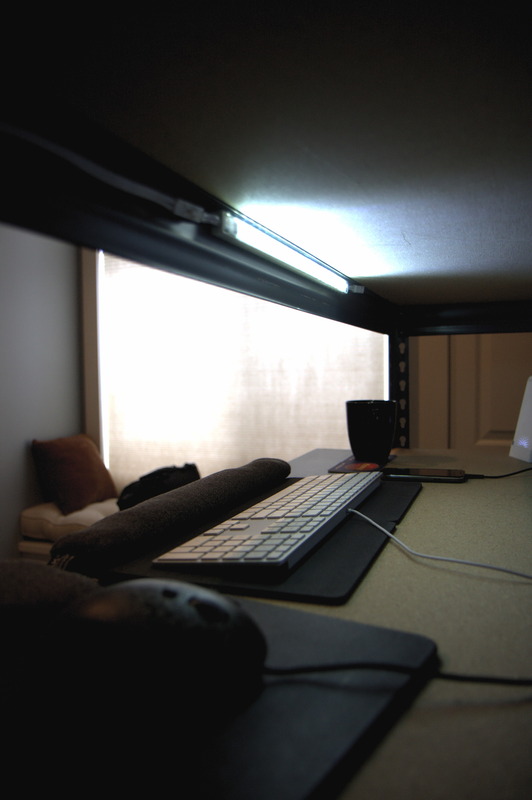 The bottom shelf is about 7" above the ground to give my feet ample space below the rack; the upper shelf was placed so the top of the displays are right about eye-level; and the middle shelf was placed just below my elbow height for the keyboard and mouse. 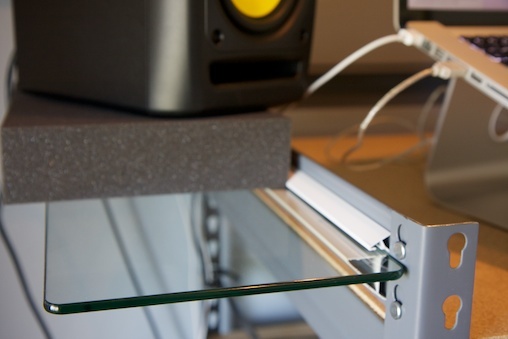 I used the extra shelf (which would have been on the very top) as a keyboard “tray” by cutting some notches in the corners to create a ledge that sticks out about six inches in the front. Some friends pointed out that MDF could potentially contain Formaldehyde in the resin used to bind it together, and that prolonged contact might cause skin irritation. 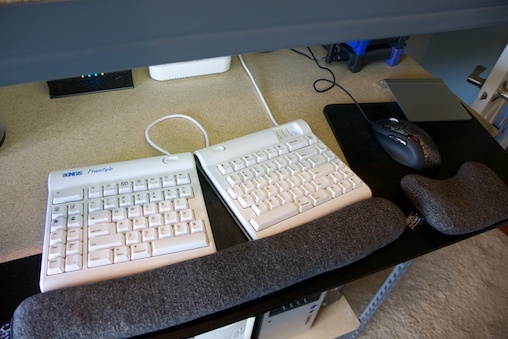 To prevent this, I wrapped the front part of the keyboard tray in faux leather contact paper. It looks nice, and prevents my wrists from getting itchy. So my hands always stay at the proper height, I use Synergy to control both my Linux desktop and my MacBook Pro laptop with the same keyboard and mouse. 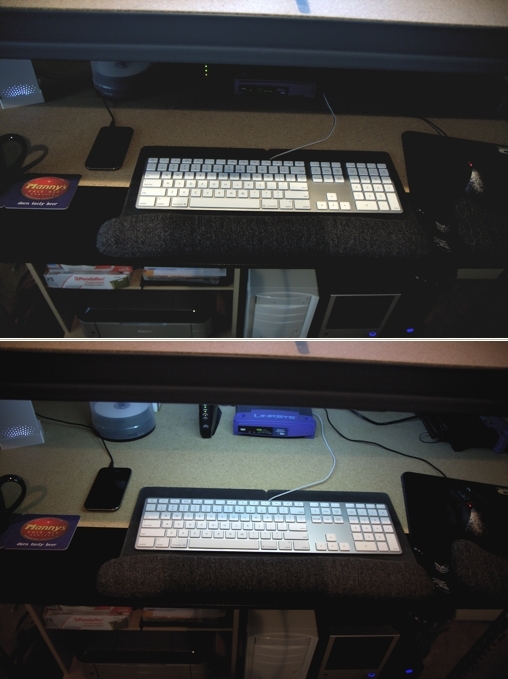 The medical community points out that staying in one position for too long (whether that’s sitting or standing) can be bad for you, so there’s also a futon in my office where I can switch to using my laptop with a Logitech Comfort Lapdesk. Eventually, I may order a tall stool, so the option to sit at the desk will also be available; although, I do plan on standing for the majority of the time. 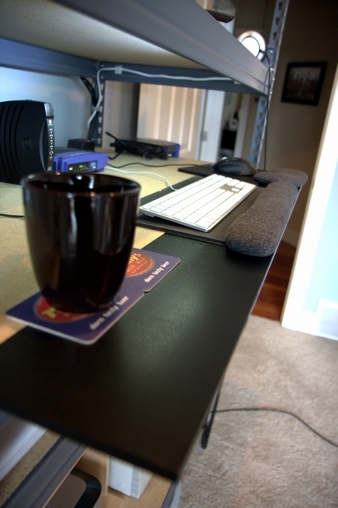 My first full day of standing was January 19th, 2011, and so far, I really love the desk. The first week was definitely a little rough, with my feet and back becoming sore by the end of the day, but it’s getting better. I’ve read that it takes a couple of weeks to fully adjust, so after I’ve given the desk a bit more time, I’ll post another update. At this point, I’m optimistic that it will be a permanent change to my home office setup. It’s safe to say that I enjoy utilizing a standing desk, and even though my shelving unit was originally purchased as an inexpensive way to get my feet wet, it has worked out better than expected. 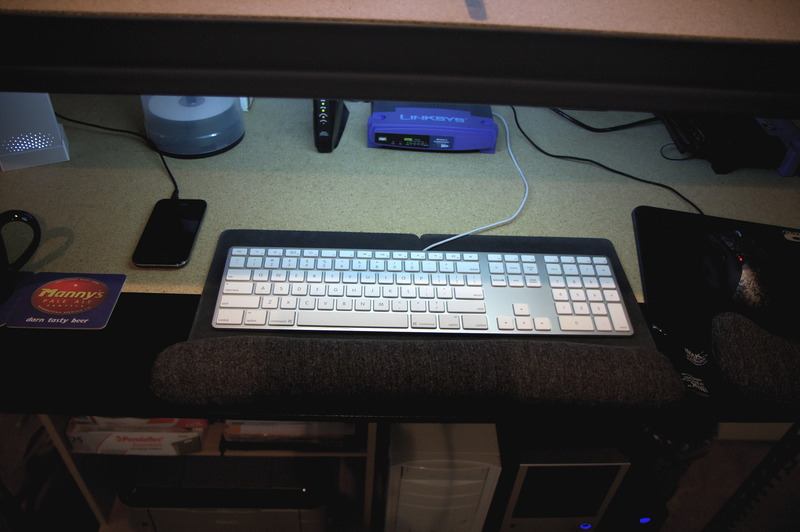 For now, it gets the job done and I don’t see the need to purchase a more expensive standing desk. The only other planned improvements I have would be, to finally cut off the extra portion of each of the metal support rails that stick out from the top, and to build small side shelves that could support a pair of KRK Rokit 5 studio monitors. Once I’ve done those things, I’ll post an updated photo of how it looks. Since posting this original article, I’ve inspired a handful of friends to try out standing desks, and all of them have stuck with it. 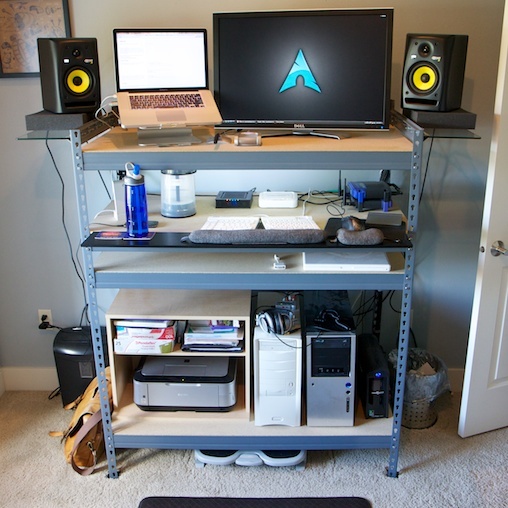 If you’ve been on the fence about trying a standing desk, I can easily say that it’s worth the effort to give it a shot. I’d love to hear from you if you end up taking the plunge! 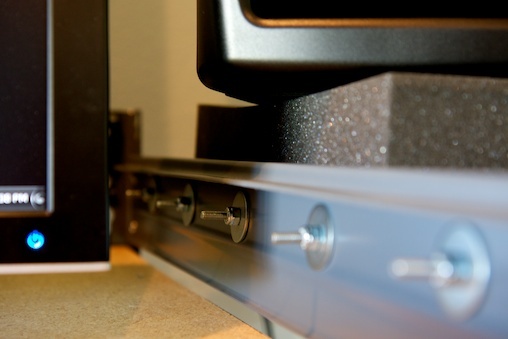 I found the shelves as a kit from Knape & Vogt for ~$20 each, but had to purchase some additional hardware (bolts, washers, and locking nuts) since they were originally designed for mounting with wood screws. The shelves can supposedly support up to 50 pounds each; they are stable, but I wouldn’t be comfortable adding much more than the current 15 pounds on them. Cutting the metal support rails and trimming the shelf mounts to fit took a fair bit of time, a steady hand, and a Dremel. If you try it, the one thing I’ll say is to definitely wear safety glasses! Anyway, I think I’m finally done tweaking things for a bit, but am incredibly happy with the results. Go forth and stand! Copyright © 2003–2013 Aaron Bull Schaefer — All Rights Reserved.